Create web albums from your digital photos, or any file, just the way you want it with this award winning software. It's free - and there is no catch! 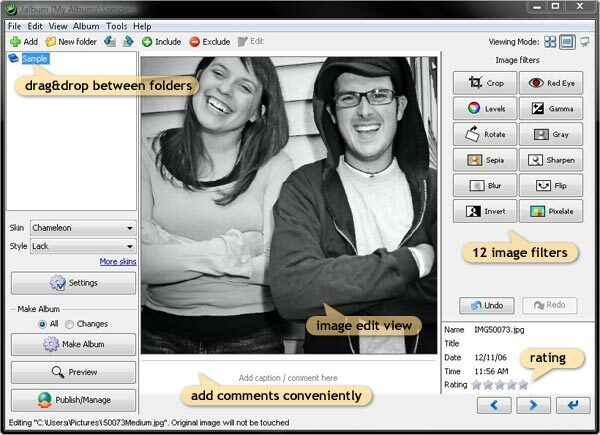 - Manage your photos Jalbum has a built in image editing features for basic image re touching and a file handling system. Polish the photos you like and remove the bad ones. It�s just a matter of drag and drop. - Customise your album Use flexible templates called �skins� to create customised albums in HTML, Flash or any other format. Add advanced functionality like shopping cart, music and more. New skins are continuously added to jalbum.net by creative Jalbum users, for you to download. Be sure to check them out. - Publish and share Publish your albums to the free hosting on jalbum.net or any site with Jalbum�s built in FTP support. Share your albums and receive feedback on Jalbum.net.